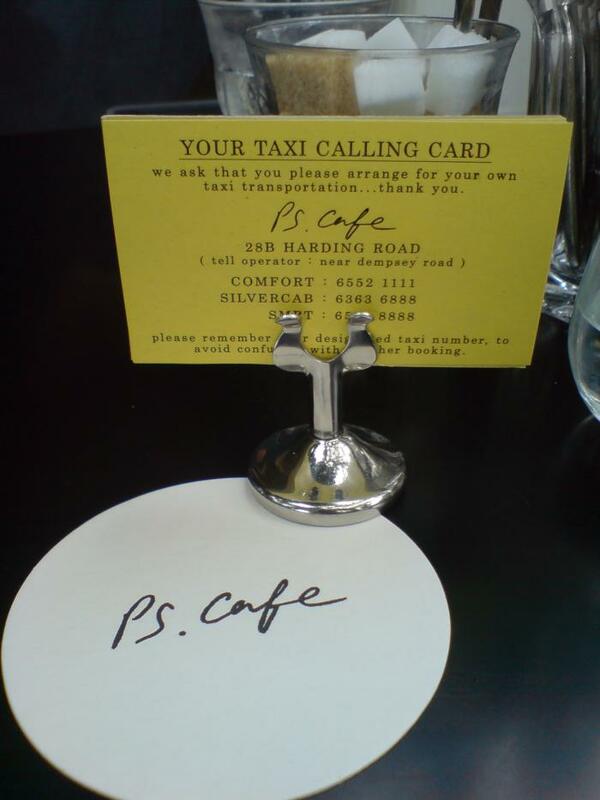 Mention PS Cafe and not many people would associate it with quality food especially when the chain is owned and operated by Project Shop Blood Brothers, an Australian fashion label. After all, what has food got to do with fashion? Interestingly though, PS Cafe has made a name for itself with its repertoire of seemingly quality desserts. PS cafe @ Dempsey is set amidst the hip enclave of Dempsey where thousands throng the multitude of restaurants and bars in the evenings and weekends. The interior boasts full length glass windows that offers a view of the lush greenery that surrounds it complete with wooden flooring and a nice al fresco area for days when the heat and mosquitoes take a vacation. The only downside to this pretty little place is the lack of a good noise dispersion system. When I was there for dinner, the place was packed withthe decibel level ridiculously high from all the chatter, very much like your typical hawker centre. Chicken Rossa Penne - The penne tasted like it came straight out of the pasta packet you can find at any supermarket. But to their credit, it was done al dente. The chicken pieces were rather generous while the sauce was just bottled tomato sauce at the very best. All in all a flat and uninspiring pasta dish. Miso Cod - The fish was a joke. It was definitely the worst dish of the evening. For starters, it wasn't fresh and had a gross fishy aftertaste. There was no taste of miso whatsoever. It didn't help that portions were tiny for the rather hefty price tag ($35) as well. Banana Mango Crumble - Desserts were highly recommended at PS Cafe and the banana mango crumble is apparently one of the best. I wasn't too wowed by it though. Sure, the crumble was nice with the scoop of vanilla bean ice cream but I just thought that the flavours of the mango and banana could have been more pronounced. Everything tasted like a soft mashed up mixture with no distinct taste. Flourless Orange Cake - I didn't have the stomach to try much of the orange cake but it tasted quite decent with its mild orangey and nutty taste. I'm sure the sauce had a part to play as well. Blowing almost close to $98 for 2 disappointing mains and 2 average desserts hardly qualifies as reasonable. On the contrary, I thought that my money was well spent during a desserts only visit to the Palais outlet (See my pictures below). Service at Dempsey was spotty as the place seemed rather short handed due to the large crowd, but definitely better then its Palais counterpart. Bottomline is, go to the Palais branch and stick to desserts. Indulge in a filling breakfast early in the morning, in the outdoors with fresh air surrounding you! 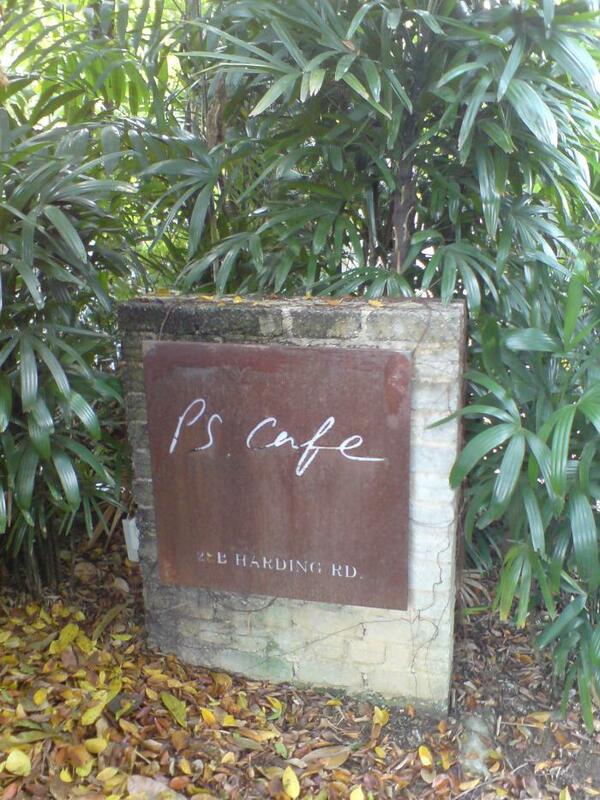 As are most diners, hidden in a corner in Dempsey Road along Harding Road I believe, is PS Cafe. A great place that's somewhat secluded, and so allows you to enjoy the peace and serenity - something you seldom get in our little over-crowded city. Nonetheless, I do understand that the place is much more crowded by noon, which I believe you will not experience it so long as you're there and leave before 11 or so? Also, they allow you the choice of an indoor pseudo-outdoor experience with the air-con and slow-turning fans or the real open air outside, with smoking and non-smoking area. Despite being a non-smoker, and would really hate it if someone was gonna smoke there, the smoker's corner was really pretty cool with some yellow chairs that look real good to laze in and coffee tables in the middle. When I was there in the morning, it wasn't packed yet. Only the tables outside at the non-smoking corner (probably also because the smoker's corner does not have proper dining tables) were fully occupied. However, there seemed to be quite a reasonable number of waiters around who were pretty quick to respond to your needs. Efficient waiters make a hungry man happy. Along with my breakfast buddy, we had, to share, a big breakfast and blueberry pancakes. Save for the "blueberry", it really does sound like 2 portions of Macdonalds' breakfast meal (that's a joke of course). 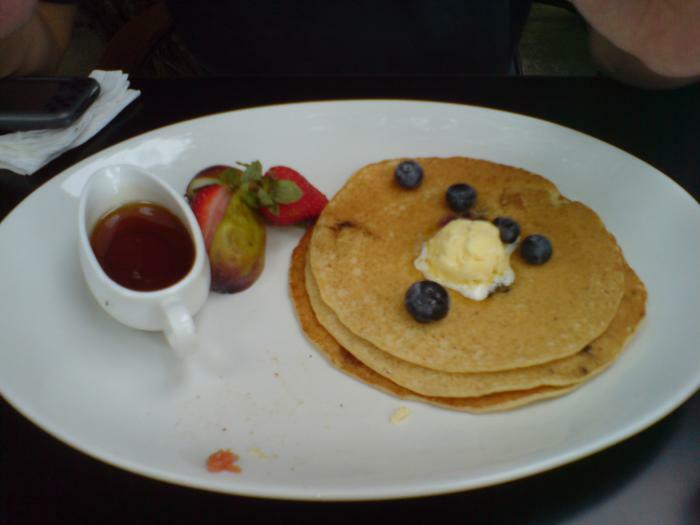 Let me begin with my favourite - the blueberry pancake. Simple as it was, garnished with blueberries and strawberries, it tasted oh-so-good. Credits go to not just the maple syrup, but the pancakes itself too. The maple syrup was good in that it wasn't too sweet and so doesn't totally cover the taste of the blueberry pancake. Also, the pancakes were absolutely delectable. It was soft, came with quite some blueberry jam/ blueberries in the pancake itself and served in a generous portion of 3 large slices. It was so tasy (and again, not too sweet) that you could eat it without the maple syrup. The big breakfast did not pale in comparison either. Again, another reasonably large serving. The breakfast came with scrambled eggs (or other choice of eggs eg poached/fried eggs), bread under the eggs, a stick of roasted asparagus, beef sausages, English bacon, roasted tomato dressed with basil leaves and a little serving of baked beans. The bread was buttery and tasty; the egg was nicely done and not over-scrambled, and went really nicely with tomato sauce (! ); beef sausage was not salty nor tough. I didn't eat the asparagus nor tomato, but it seemed like my breakfast buddy enjoyed it. Baked beans didn't seem out of the can, as it wasn't as sweet as those. All in all, I thought the breakfast was good as the flavour of the food served wasn't too strong for the first meal of the day. And being outdoors made it even more refreshing (despite the occasional falling leaves). Along with a mocha and hot chocolate, the breakfast was complete. 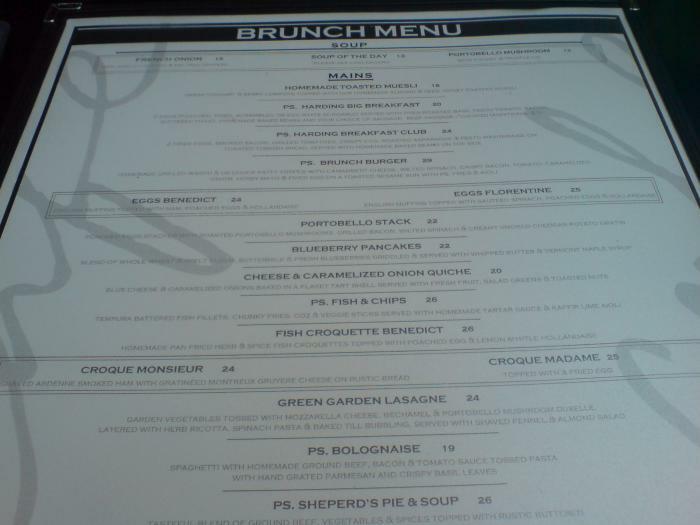 (Of course this was only based on my breakfast experience, I didn't try their desserts/ lunch etc). Although I may have sound like I enjoyed my time there, it really isn't a place I'd go to everyday. The bill came up to just over $60 for 2 and I think that explains my previous line. Apart from that, it is not a very accessible place for a person who doesn't drive. Nonetheless, if you're planning on going, do not worry as PS Cafe has impressed me by the provision of a card with all the numbers you can call to get yourself a taxi out of the place. Interesting and impressing. So if you're looking to pamper yourself for a day, after a look week of hard work perhaps, maybe PS Cafe would be nice, albeit not an everyday-place. yeah ps cafe is good. there are a few outlets but i think the dempsey one's nicer. at least you get the ambience with the price. 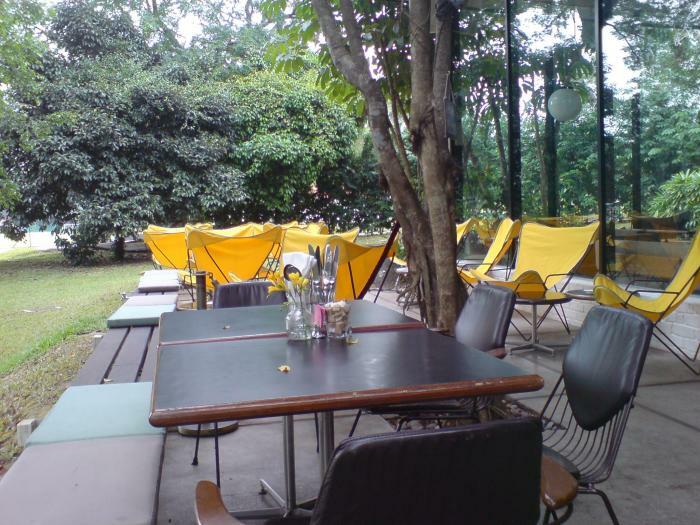 located near dempsey, PS cafe indeed provide a very different experience from other restaurants in town. it has nice ambience, near to nature and actually quite hard to find the place on my first trip. special menu, i was asked if id like to try kangeroo thigh when i first sit down. sounds like fear factor when my friend heard that. we chose not to be that adventurous and ordered mushroom pasta with truffle oil. bad move for someone who havent tried truffle before, coz i really think the pasta taste like some puke. no offence. but i cant accept the taste. chilled out at the outdoor area with nice tea lights illuminating the place making it a really beautiful and relaxing place. she then look around the area, (which was obviously very empty) and gave us the impression its really difficult to give us a table without reservation. it was a tuesday evening and its still quite early, how difficult can it be? urgh. it was till later i realise the crowd that followed are mostly expats or some tai tais. but they didnt fill up all the tables too. so its a high class place and not being tai tai or expat means we cant have a table is it? well at least thats the impression given. alright, complains aside, conclusion: really nice environment. okay food, rooms for improvement on its services.